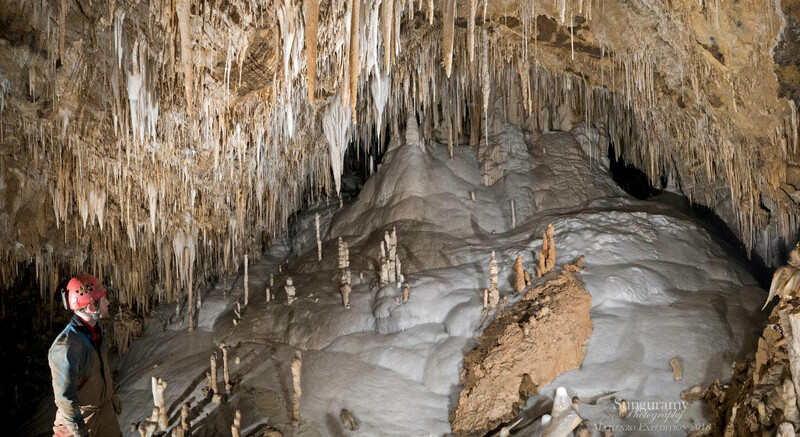 In 2018 just under 6 km of new passage was surveyed and 137 new caves and sites of interest located in this important caving area of Northern Spain. Well over 300 km of passage have been found by the UK led expedition over the past 47 years. 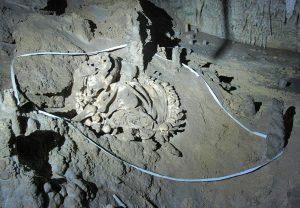 As well as finding new caves and surveying them, the expedition members are also involved in supporting scientific work including: archaeological work; helping a number of research projects to date changes in climate using stalagmite analysis; examining the biological diversity in the caves and testing and mapping water flows. The expedition takes place at different times over the year with most people attending at Easter and during August. It is important not only for the caves it explores and records, but is an opportunity for younger cavers to easily take part in an oversea expedition and learn from other more experienced members. They also can help to develop surveying and prospecting techniques in caves, which can then be applied elsewhere. 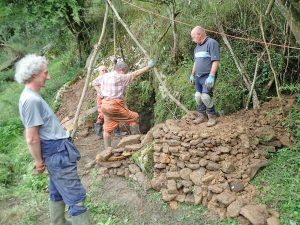 The expedition is also unusual as being based in a village in easy reach of amenities it means some cavers who have family commitments are able to travel with their families and take part in the expedition work. • The discovery of the 167 m deep Drone Pot with passages still to be pushed off the main pitch that could link into the 35 km long South Vega System. The expedition also has been mapping the drainage in the areas and so identify the hydraulic extent of the various resurgence caves in our area. Figure 2 shows the results of test carried out to date and also gives an idea of the caves found and their extent. Cueva Vallina is currently almost 35 km long and the river in the cave has been shown to flow to the 35 km long South Vega System. So if connected it would make a system well over 70 km in length. We also know the system must extend to the west where sinks have been shown to flow into the caves. climbing Jochen’s Aven at the end of FN passage to a height of some 35 m noting a number of leads including a boulder choke that looks to lead into a big passage and other passages needing more climbing to enter. Work was carried out in the Galería de la Cisterna (West off Swirl Chamber) area to push a number of pitches and passages and to complete the survey of this area, 168 m of cave was added in this complex area. A two-man diving team worked in the main upstream Rio Rioja sumps pushing and surveyed through sumps 6 to 8 with walking passages between them and then along a streamway to a crystal-clear sump 9, not yet dived. In addition, the almost 400m of sump and unsurveyed passages which were pushed in 2017 from sump 3 to sump 5 were surveyed. Torca del Dron was found using a drone, the open surface shaft leads down pitches to a big 80 m shaft with passages going off at the sides. At the bottom of the big pitch, further pitches followed to where leads choked off. Almost half a kilometre was surveyed, and more. Cueva del Bosque was extended from a small cave to a fantastic sporting pothole. To gain access a dig was opened up to provide pitch into a short passage, just beyond was Squirrel’s Pitch – a magnificent 75 m deep, 10 m diameter drop. The tortuous rift at the base was followed for 15 m to a squeeze and the 10 m deep Helmet Trapper pitch. A comfortable descending streamway soon ended at a steep rift to the take-off point for the 50 m deep Double Six Pitch described as “another stunning descent in a large, beautiful shaft with the stream falling at the far side”. The pitch ended at a 15×8 m flat boulder floor with the only outlet being a flat-out crawl – Roll Again. This soon met a sizeable streamway – the Río Dado that ended at sumps. The upstream sump was dived and found to be 6 m long to a passage ending in a small chamber needing work to make progress. 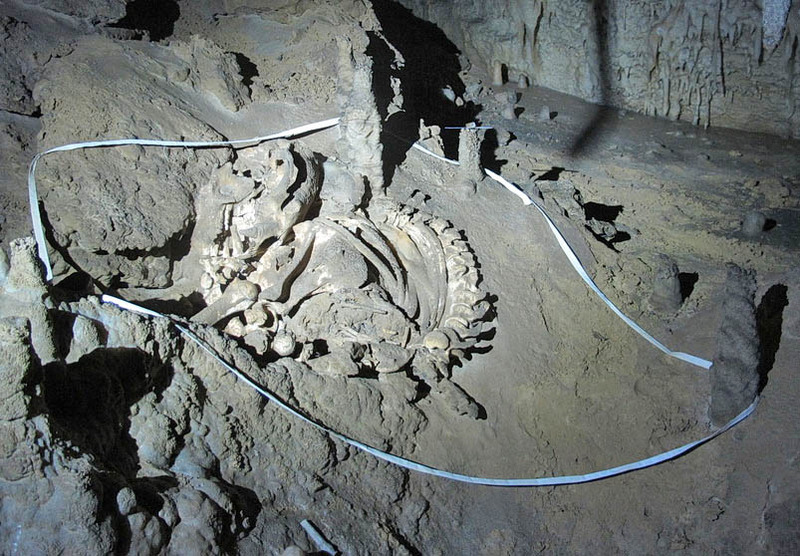 Cueva-Cubío del Llanío was pushed hard but the connection with Cueva de Riaño that will make a system over 75 km long with potential for much more, is very close (tens of metres) but is still to be found. However, in looking for this link a total of 862 m of new passage was surveyed. A major diving project in Fuente Aguanaz which has a average flow of 1 m per second, was hampered by the wet weather, and on one occasion the water flooded the top entrance area submerging stored diving gear. Despite this over Easter and August, the diving team added over 400 m to the system and left a number of open leads for 2019. This cave has a massive catchment as our dye test has shown with the test this year from a sink some 7 km to the south. A 90 m long inlet on the east past sump 2 was found in the summer this was pushed to a passage leading to a chamber (Rudolf Chamber) where one of the team slipped on a climb and landed on his nose causing him and his partner to exit the cave but leaving some of blood behind. 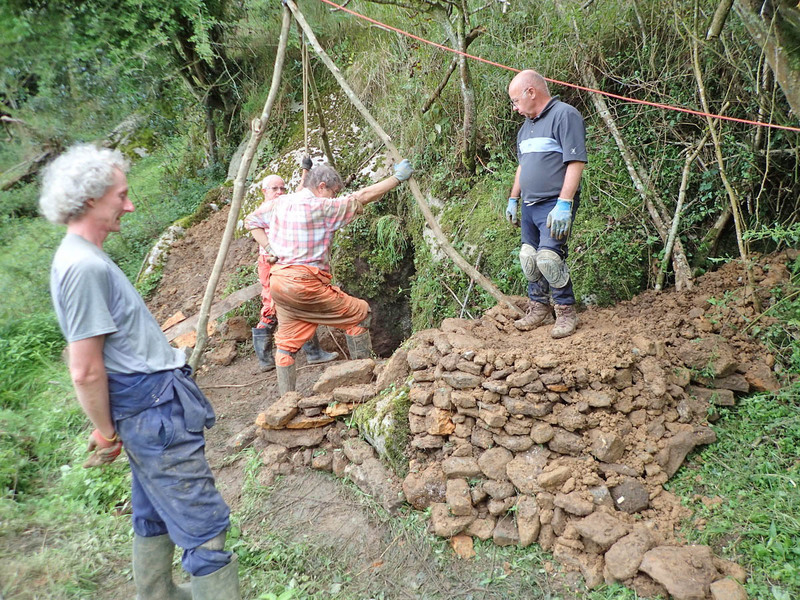 At sump at the end of the main passage the team got to a low airspace in the tight passage with the sound of running water beyond, in the summer rocks were capped and some 9 m of progress made but high water levels made this work difficult. More capping is needed, preferably with lower water levels in 2019, to make progress at this key site.